France have prevailed for their second World Cup triumph, England surpassed expectations into fourth and big names exited early, as attention quickly turns to the upcoming domestic football season, Oddschecker is casting its eyes back to an incredible four weeks in Russia. A total of 166 goals spread over 64 games, including 22 penalties (six missed) in normal time and 12 own goals, not to mention the controversial video assistant referee (VAR), ensured plenty of drama, euphoria and heartache. Despite just one goalless draw (France v Denmark), and the favourites coming out on top more than 2014’s offering, Oddschecker details that bookmakers have still enjoyed a “relatively favourable tournament”. Priced more aggressively than last season’s Premier League, “with a tournament 1×2 OR of 103.7% (22 bps tighter than PL 17/18 avg),” it was also highlighted that the knockout stages “was priced marginally more keenly, 4bps, than the group stages”. It was also argued that high-margin request a bet type wagers “are being used to subsidise the more vanilla 1×2, FGS, BTTS offerings”. 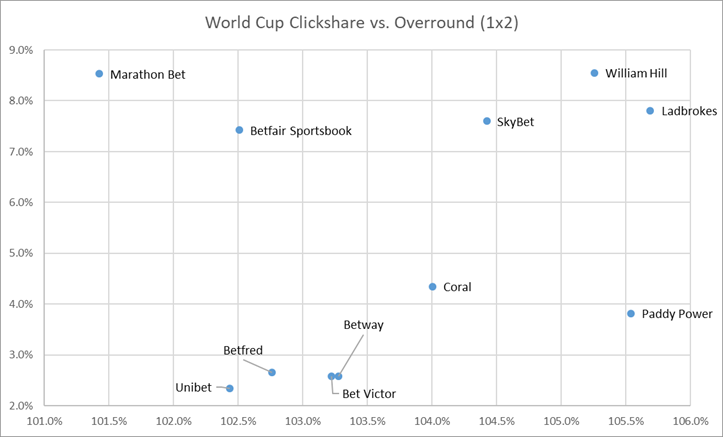 Marathonbet offered the tightest prices 1×2 sportsbook of all Oddschecker partner brands, as highlighted in the price vs clicks graph – which excludes bet365, who boasted a clickshare of 30 per share and tournament OR of 102.7 per cent. England’s exit, as well as the fact only three of seven meetings were won in ninety minutes, also boosted margins, whilst “VAR proved an expensive development, as bookies were slower than punters to realise this trend”. The increase rate of penalties “cost bookies dearly,” with a normal frequency of 0.2, one in every five games, rising to 0.35 in Russia. Concluding, Oddschecker detailed “pre-tournament France (fourth favourites) were best priced at 8/1 with Blacktype (while Croatia were as long as 40/1 with Sky Bet).